Much of our time is spent at the office, making it one of the main spaces we live in. We know how important it is to have a nice and organized working environment; therefore, we decided to help you out. It doesn’t matter if it’s a small or generous desk area — what matters is making it your own. Take a look at out selection below and choose from a spread of products which help transform your office into a great environment that enhances productivity. This great desk pad comes with a multitude of benefits for your complete comfort while working. The unique arc angle lip is designed to wrap around the edge of the desk, buffering the contact between the edge and your body. This feature protects your clothes from getting damaged and provides stability to the mat. The pad offers a generous working space, acting as a mouse pad, as well. Moreover, its smooth surface helps with reducing writing fatigue, and it will not get scratched or stain during use. If you are not sure how this unit will fit your desk, then it’s good to know this item comes with a 30-day money back guarantee and a 180-day limited product warranty. Are you always looking for a USB port around you desk? We have a solution right here. This Simpeak 4-port USB desk charger comes with an innovative desk mount design which allows better use of space. The product comes with two ferrules fitting grommet diameters of 2” and 2.4” and a multi-circuit protection system. This feature is great as it protects the product, as well as your device. Another benefit is that the 4 USB ports have a combined 6A output which can charge 4 devices at the same time, while each port can charge a 2.4A mobile device as fast as the original charger. If you are looking for solutions to save some space, then take a look at this mesh desk organizer. The design includes two side load letter trays that come in handy when you have a lot of paperwork. The 3-compartment drawer helps organize all the little objects around your desk, while the upright section has five compartments sized at 2”, making it a very good solution for your files and letters. The product does require assembly, but the good news is it’s very easy to do, and everything you need to put it together is delivered within the package. A very cool accessory, this headphone hanger is a great item for your desk. The updated model is sturdier than before and thus safer for your headphones. The smooth and bent edge design protects your headphones from scratching and dropping, while still keeping them within arm’s reach for easy access. The hanger works well for a wide variety of headphone models. In order to get the hanger into place, you only need to peel off the cover of the double-sided adhesive and stick it under your desk or onto another chosen surface. Make sure the surface you place it on is clean and smooth. Working ergonomically can be easily overlooked, but it’s an important component of a healthy and productive day. This footrest provides enhanced comfort while you’re typing your emails and can be easily placed under the desk. The elevated feet and legs maintain an improved alignment and overall posture. Moreover, the free-floating platform tilts back and forth for leg stretches leading to improved circulation. For those working from home or in a very comfortable environment where shoes can be taken off, the textured surface creates a massaging effect on the soles of your feet. As for the product’s stability, this foot rest stays securely in place on a carpet. A great desk tool, this Honsky stand has a solid aluminum construction that ensures stability. Available in different colors, the model suits any office space adding an elegant look and feel. Designed for smartphones, tablets, and e-readers, it can be placed both horizontally and vertically, and you can charge your device while using it. With all these features, you can comfortably surf the internet, display pictures, watch videos or read content. The stand comes with a 30-day free replacement or refund guarantee, making it a great choice even if you are still mulling over whether it goes well with anything in your office space or not. This multi-plug outlet power strip features eight surge protected outlets that can provide energy to different appliances, while the 4 USB ports are a great addition for conveniently charging mobile devices. The 4 sided distribution of outlets and the 0.8” space between each cube plug create enough space to accommodate even larger chargers. The model comes with 2 ON/OFF buttons on top of the tower, allowing you to turn off only one side in order to conserve power while maintaining the other part still in use. The product comes with a 6.5ft power extension cord and built-in overload and surge protection, for a risk-free usage. A beautifully designed rack made out of natural wood, this Jerry & Maggie item is a very good choice especially if you are already going for a green and healthy lifestyle. With excellent craftsmanship and its sturdy construction, it can be easily used for storing office supplies, books and even plants. The product consists of two main parts with adjustable positions and some distance between them, in order to fit your needs accordingly. The best part is this rack is a beautiful office decoration as well. Weighing 2.6lb, the unit is easy to carry from one place to the next, making this model a great space saver you can choose for your desk. Did you think we would forget about desk toys? Even at the office it’s important to maintain a positive spirit. If you are looking for a great gift for your boss or a colleague, then you are in the right place. This executive sandbox is a great desk accessory and quite the conversation starter. The product consists of a miniature hardwood sandbox that comes with ultra-fine pearl white sand. The package also includes a little club and little golf balls, making it the perfect gift for a golf lover. The only thing you must pay attention to is to avoid spilling the sand, as it is really is ultra-fine. Keep the cables around your desk organized with this simple, yet effective system. This is a rather useful product that can be used at home, as well. The cable clips will keep the cords accessible for when you need them. The special S shape ensures a perfect fit for any desk edge, the thickness going up to 2.36”. Moreover, the desk is protected against damage or marks thanks to the high quality silicone material used. The product offers a 30-day money back guarantee, making it a safe purchase if you are still wondering if this model suits your needs. Your office is your second home. Even if you’re not the typical creative worker, you’ll most certainly feel the need to personalize your workspace. Although most people go for photos of their relatives or their friends, maybe you want to up your game a little bit. Instead of parading photos of your family, you can always opt for a more interesting solution, as there are a lot of innovative desk accessories out there, designed not only to serve their function but also to express style and individuality. If you’re having trouble choosing the perfect desk paraphernalia, or if you just feel like spoiling yourself and ordering some fancy trinkets from an online store to show off to your work colleagues, we’re here to help you make a cool choice! Remeber office accessories shouldn’t just be useful, they should be stylish and reflect your personality, and with a large number of options on sale these days, there’s no reason why you should limit yourself. If you don’t have the patience to go through every browser page there is about cool desk accessories, all you need to do is follow our guide and also remember to follow your inner sense of personal style. Choose wisely, and the compliments on the coziness and stylishness of your workplace will never cease to appear. We know the first temptation must be to rush into a stationer’s shop and pick out the cheapest items that come in the largest amount possible since we all agree that office work makes you go through a lot of materials. But if this policy works for most of your supplies, there’s no reason why you should act the same when it comes to things that are going to be around for quite a while. Instead of going to your local store and pick out the dullest, we recommend you spend some time online surfing through all the smart items that serve more than just one function and are also designed to look good on your desk. Find the ones you enjoy the most and make your office life more fun! Every good professional will tell you that keeping an organized desk is not only for your benefit. Apart from increasing work speed and making it easier for you to find the items you need, it also says something about yourself. No employer likes to see his employee’s desk in complete chaos, even if it’s a type of chaos you know your way around. If you’re not working in creative businesses, try to keep your office as tidy as possible, to maintain an image of harmony and composure. Among the cool desk accessories that can help you do so, there is the old school pencil box, which has recently undergone a complete transformation and can now be found in many shapes. There are also the set of trays and improvised boxes to help you divide your instruments and the bookstand for your notebooks, catalogs, and registers. However, instead of just taking things for granted, you can always go a little further when decorating your workspace. For example, you can bring pencil cases from home that you personalized, or use stands for the most important gadgets on your desk to leave the space beneath them free for storage. There’s no limit to how far creativity can go. And by personalizing, we certainly don’t mean printing a photo of your dog over every item on your desk. 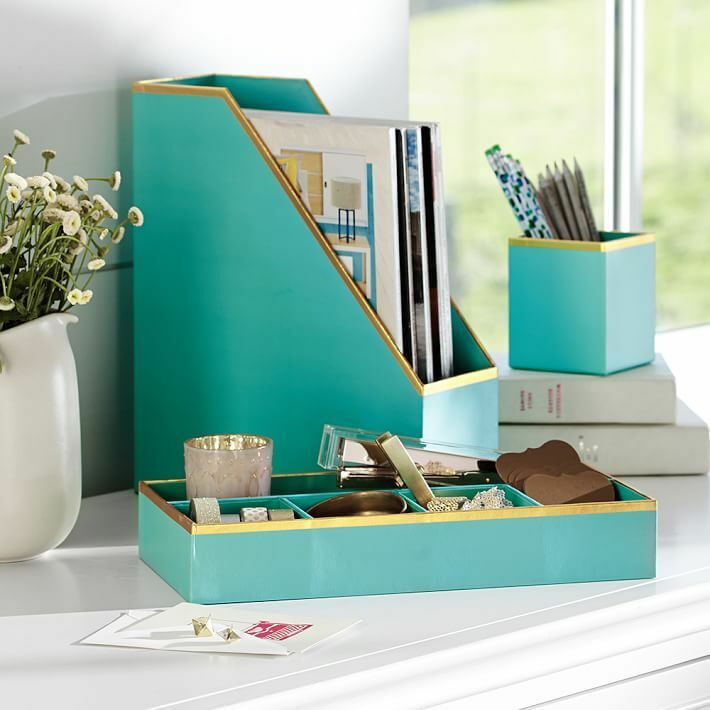 When shopping for desk organizers, look for designs that you enjoy, shapes and colors that you find interesting but also remember to make a purchase according to the size and characteristics you need in a product. Even the best desk accessories reviews can’t help you decide if you don’t know what you want. When it comes to office chairs, most employers don’t let you bring your own. However, if you are lucky enough to have this possibility, you can opt for a chair you’re most comfortable in. Considering you spend more than half of your awake time in the office, comfort should be the first aspect you take into consideration when buying an office chair. However, you still want it to have certain other characteristics. For example, being in a restricted environment, the color shouldn’t stand out. Opt for a neutral color like black or gray that will blend in with the other pieces of furniture you already have. When it comes to design, you are free to choose the shape you feel will express your attitude, but unfortunately, you don’t have that many options to chose from. Although a colorful tapestry will certainly make a statement, we recommend you leave such experiments for your home life. Every professional knows the coolest office accessories you can get are the ones which are considered the small details that truly make a difference. From your computer accessories like USB drives, small gadgets like a digital clock or a pair of headphones, to decorations and the general style and outlook of your work space, everything can and should say something about you. Choose wisely, and pay attention to the tone of your office, since your desk should also send your employer a message about who you are and what you expect from your collaboration. Considering the wide range of desk items you can choose from in online stores, there’s no reason why you shouldn’t add a little personality to your private space at work. If you want your productivity to increase, you have to focus on creating a more enjoyable work environment for yourself. Know your preferences, have confidence in the choices you make and don’t shy away from showing your personality in the office! Also try to keep in tune with the general atmosphere, while still managing to show your individuality. Keep in mind that a minimalist style, organized desk is the mark of a responsible and proficient employee. 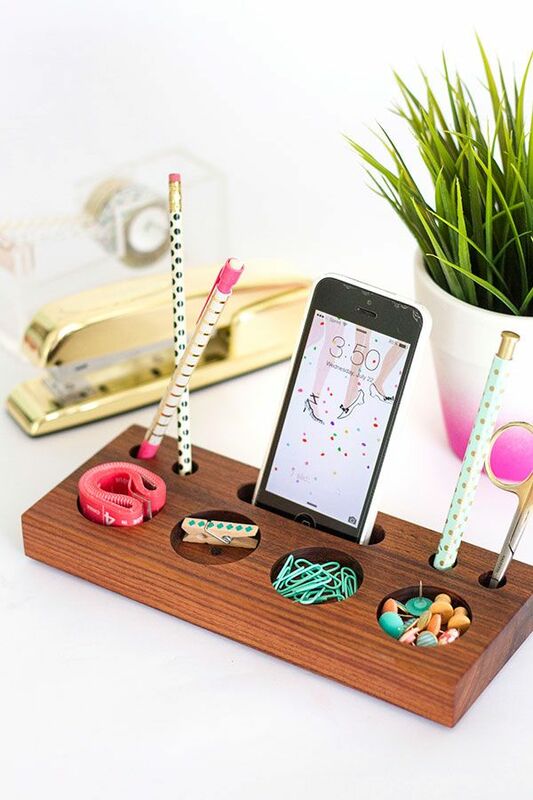 Follow our rules when you pick out your new desk accessories, and you’re sure to make a good impression at work!